Jhy-Wey Shieh sees the link between Taiwan and Germany as obvious: ‘The word “trade” – of central importance for Medica – starts with “t” for Taiwan and contains “de” for Germany – there is no better way to put it.’ Even though the Taiwanese ambassador’s linguistic journey was not to be taken too seriously, this year’s presentation from the Taiwan External Trade Development Council (TAITRA) emphasised a strong bond between the two nations. Under the banner ‘Taiwan Excellence’, TAITRA arrived at Medica 2018 with a whole range of innovative medical technology – from virtual 3-D anatomical models to robotic rehabilitation helpers and smart nappies – many awarded the Taiwanese seal of approval. ‘New technology can give us effective tools to deal with the challenge of people living longer,’ observed Dr Dar-Bin Shieh, Deputy Minister for Science and Technology. Artificial intelligence, Big Data and personalised medicine will advance diagnostic and therapeutic opportunities – for the old as well as others – to entirely new levels,’ he predicts. ‘Many people know virtual reality (VR) from movies such as “Ready Player One” or from video games. Technology here serves mainly to escape from reality – but we can also use it to solve problems in reality,’ explained Lewis Chang, who introduced new products from HTC subsidiary DeepQ Technology. Known for smartphones and the VR glasses HTC Vive, the firm also provides medical technology solutions. One of these is 3-D Organon, a three-dimensional, interactive anatomy atlas used in medical training. ‘Students can move freely around an anatomical 3-D model, take it apart, layer by layer, and therefore better understand the body’s spatial structures,’ Chang explained. This does not replace working with real bodies, but offers an additional method to teach and learn. The mind also can be healed via VR solutions: Oxford VR is a programme aimed to treat psychological disorders such as vertigo. ‘If you can practice crossing a high bridge in the virtual world you will later find it easier in reality,’ Chang pointed out. In Taiwan, VR therapy is already used successfully; now the European market is to be convinced of the new technology’s potential. Virtual reality (VR) can help teach medical students human anatomy – HTC subsidiary DeepQ Technology presented their take on VR with‚ 3D Organon. 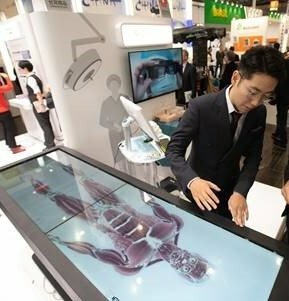 The ‚Asclepus surgical table‘ from taiwanese company Taiwan Main Orthopedics Biotechnology is a one by two metre display that can be used to show life-size bodies. The Asclepus surgical table from Taiwanese company Main Orthopaedics Biotechnology also banks on the power of virtual 3-D models. On a display measuring about one by two metres, the table shows life-size bodies that move and turn freely, and can be taken apart. Next to generic body models that can, for instance, be used for trainee surgeons, patient-specific data can also be displayed, so the table can additionally be of great help with surgical planning, according to MD Min-Liang Wang, during the TAITRA presentation. The company also produces Foresee-X smart surgical glasses, introduced last year. For 2018, Wang introduced the second generation of the mixed-reality glasses, Caduceus. ‘They allow surgeons to display additional information without having to take their eyes off the patient to look at a screen,’ he explained. AmCad BioMed uses ultrasound-based technology for fast and reliable diagnosis of obstructive sleep apnoea (OSA), saving patients from long-winded and unpleasant examinations in the sleep laboratory, which they then only undergo if really necessary. ‘Around 25% of the adult population suffer from OSA,’ said AmCad president Yili Lee. ‘Some only have a mild form of the problem, which hardly affects them; others are severely impacted and treated too late because they shy away from examinations in the sleep laboratory.’ The product is reported to assist in a reliable diagnosis of OSA risk and grade within just a few minutes, with the patient being fully conscious, AmCad vice president James Lee said. Rehabotics Medical Technology demonstrated its ‘mirror hand’, a mobile exoskeleton that helps to regain motor functioning lost after a stroke. A sensor glove on the other hand records movements, which are then ‘mirrored’ by the exoskeleton, explained Rehabotics MD Jian-Jia Huang. Many products introduced at Medica are on the brink of gaining the CE-mark, or are already available marketed in the EU. The TAITRA presentation confirmed once more that medical technology ‘Made in Taiwan’ is a notable force – in Europe, too. 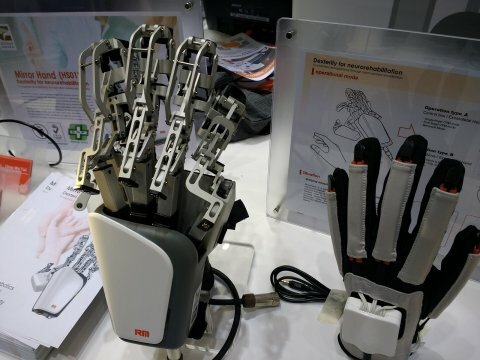 The ‘mirror hand’ helps stroke patients to regain hand movements by linking the healthy hand to an exoskeleton that copies movements via a sensor glove.